Funland is set in the fictional Californian town of Boleta Bay, where the weather is fine and the girls are finer. A place where the guys need the breeze, rolling in with the surf, just to cool them down as they look at all those shapely bods stretched out along the beech. It is, in short, a pretty cool place to live. Sixteen-year-old Jeremy Wayne thinks so anyway. He and his mother have just moved to the Bay and he is awestruck. Boleta Bay is a vacation place, but he gets to live there! There are several viewpoint characters in Funland, Jeremy is one of them and the reader gets to see the world through his eyes quite regularly. He seems a pretty okay kid really and one gets the impression that he never really fitted in where he used to live. So Jeremy sees Boleta Bay as a place where he can make a fresh start. Nobody knows him, so he can be anybody he wants to be. He is therefore very anxious to make a good impression on people and avoid being labelled a dork again. 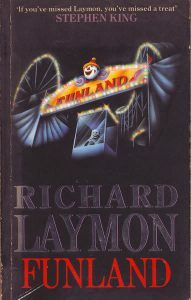 The reader is introduced to Jeremy in the third chapter and finds him on his way to the Funland boardwalk; where there are all of the usual entertainments: roller coaster, Ferris wheel; you know the sort of thing. The boardwalk is also home to Jasper’s Oddities. It used to be a freak show, but now the freaks are gone and all that remains of them are their photographs, pinned to the wall in the Gallery of the Weird. Visitors have to pass through the gallery to reach the real oddities such as the giant spider that Jasper found in New Zealand. The spider is now stuffed and on display and visitors can take a good look at that and try to take their minds off the rest of the displays, like the foetus in a jar, or the mummy strapped to the wall. I won’t list them all, suffice it to say that it would be best to finish eating your waffle cone before you went into a place like that. Afterwards, you might not want one. Jasper Dunn also owns the funhouse, on the opposite side of the boardwalk from his Oddities. Jasper’s Funhouse was boarded up five or six years ago though, after a couple of his freaks escaped one night, got into the funhouse and assaulted an old lady and her granddaughter. After that the freaks had to go and Jasper could no longer afford the liability insurance on his two-story funhouse. Jeremy makes a new friend pretty quickly when he meets a guy named Cowboy. Cowboy is a similar age to Jeremy and seems to be quite a popular guy. Exactly the kind of guy that Jeremy needs to make a good impression on if he is to fit in at Boleta Bay. Jeremy does make a good impression and it is not long before Cowboy is introducing him to some of his other friends: Liz, Samson, Randy, Heather, Karen, Shiner, Nate and Tanya. Jeremy hits it off pretty well with all of them, particularly Shiner. She is quite a babe—and she is interested in Jeremy. Jeremy is interested in her as well, but he is obsessed with Tanya. Tanya is a lifeguard and the head cheerleader at school. If shiner is a babe, then Tanya is a mega-babe and Jeremy is not mature enough to realize that a bird in the hand is worth two in the bush and that the girl holding his hand (Shiner) is probably worth any number of Tanya’s. Tanya may have the looks, but she is manipulative. Tanya is never the viewpoint character, but she is, nonetheless, a very important character because she was the one who brought the group together and they are trollers. Troll, in this context is another name for a tramp and trollers are people who try and clean up the streets by getting rid of the trolls. Apparently trolling really does happen in some Californian communities. Tanya had a bad experience with some trolls, she wanted revenge, and that is how it all started. Nate is her boyfriend and so he wanted revenge for her as well. The rest of the gang have their own reasons for being involved, but with most of the male members of the group trolling is, as much as anything, an excuse to be near Tanya. The same can be said for Karen because even she’s got the hots for her, but, one way or another, they all hate the trolls. Funland is a horror story and I must warn you that there is no shortage of blood and gore in the book. Bad things happen to the trolls and bad things happen to a lot of other people as well. And as you get further into the book you realize that the trolls are not exactly innocent victims. There is more going on tham it at first appears and even Tanya and her gang don’t realize just how much is going on until they are in well over their heads. If you decide to read Funland, other characters you will meet include Dave and Joan (the boardwalk cops) and a banjo-plucking minstrel girl called Robin. These three are also major players in the story and they are very believable characters that are easy to like. All of the characters in Funland are believable though, even if a few of them only survive a few pages. That is one of the things that I enjoy most about Richard Laymon’s work: his characters. He was a hell of a writer and Funland is one of his best works. I have already warned the squeamish that the book contains some rather. nasty scenes, but any reader who is easily offended could always skim past those parts if they wished and I would not be surprised if they enjoyed the book anyway because Funland is a not just a great horror story, it is a great story, period! Funland is 500 pages long, there is a lot going on in the book and I cannot recommend it enough!